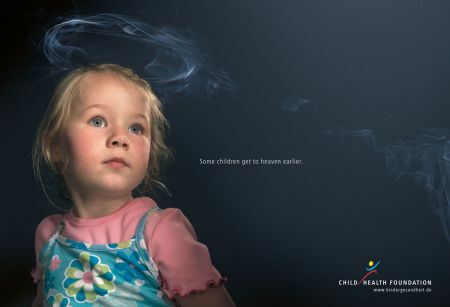 The Child Health Foundation releases this ad to demonstrate one of the bigger cons of smoking with a very light touch. Copy reads, "Some children get to heaven earlier," and the campaign is by Serviceplan, Germany. We're feeling a little bummed about it, and we don't even have kids. Or smoke. We wonder if we walked around with little halos on our heads like that and if mommy and daddy just chose to ignore them. We have some of the same type of Ads showing up on Omaha television and even though I'm not normally a fan of commercials like these, they are very well done. I grew up in a house where the family pipeline welder went from three packs of cigarettes a day to chewing tobacco. We learned to pick up a peanut can and shake it to see if it sloshed or rattled. That ended in blatter cancer which was real nasty. It does ring in your ears for a long time.